Formerly labelled F-1.533 and XP2 (XP for eXpatriate Paris). The name, "Later Netherland pattern" used by Sylvia Mann, is not recommended, as there is little or no evidence that this pattern ever reached the Netherlands, nor was ever made in Belgium. However, it did get into Portugal, where it took root. In All Cards on the Table #154, Sylvia Mann ascribed the origin of this pattern to Germany, and probably to Wüst. There is no doubt that he did indeed make versions of this pattern, as proved by an uncut sheet in the B.M. Schreiber collection (estimated to date post-1866). There is also a pack A1334 in the DSM Leinfelden (formerly in the von Hase collection) catalogued as c.1850; this pack has Wüst’s trademark on the J . The DSM also has an anonymous pack (B1449) with very unusual Queens in tight-waisted dresses, catalogued as c.1820. It may have been the Wüst version which was adapted in Turnhout to form the modern "Dutch" pattern [IPCS #76], by replacing the Queens with a distinctive set. However, versions of the original pattern were evidently exported to Portugal, where they were perpetuated in the 20th century by Portuguese makers. One such example, by J. J. Nunes still has scenic aces of the Rhine. Usual XP format (i.e. with a horizontal dividing line). Although it is the four Kings that carry the features of the pattern that distinguish it from most other XP patterns, only the Queens differentiate it from its off-spring, the modern "Dutch" pattern. In the present pattern the Queens hold various flowers in the traditional way, the Q being in profile and holding a tulip. The Kings are not greatly different from those of the unnamed forebear [IPCS #72] except that the angular shield, held here by K , only has a small part of the top visible, and the King wears a crenellated crown. The sword formerly held along with his traditional orb by the K has been replaced by a sceptre with a very large and ornate top. The Jacks all carry halberds, and wear feathered hats, that of the J being at a rather rakish angle. It is now the J who grasps the edge of his cloak (in the pose of the J of the old Paris pattern). The Jacks and Kings are repeated in the modern "Dutch" pattern. 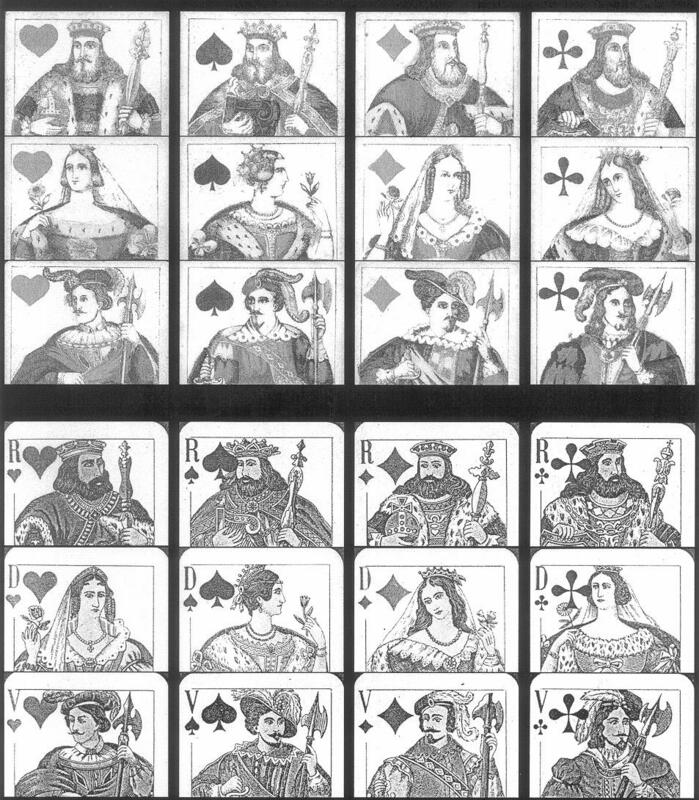 The similarity of the Kings to those of the German-suited Württemberg pattern (noted by Han Janssen in Playing-Card World No.28) must date from the hey-day of the present pattern. King, Queen, Jack and numerals. 52 or 32 cards in German packs. Portuguese packs for Solo and Voltarete are in the peculiar 40-card form with numerals 8 and 6-2. All Cards on the Table #154 shows all courts and scenic aces of a 52-card pack by an anonymous maker, probably German. The DSM Wüst example is illustrated in Playing-Card World No.29. Cary GER 66 is an example with scenic aces of Napoleonic battles, anonymous, c.1850. See also De Geschiedenis van de Speelkaart by Han Janssen, bottom of p.146, and bottom of p.149 (a Portuguese example). Germano & Ca., Lisbon c.1880; Lit. Maia, M A Beato, Justero Rodrigo, all of Portugal, 20th century. Top three rows: Anonymous example with Hessen tax-stamp of 1810-c.1870. Bottom three rows: J. J. Nunes, Portugal, 20th century, from the collection of John Berry.